Three years (..and two days) since starting my blog. Man, I’m not really sure what to say! It’s weird enough to think that I’ve been on here for 1/6 of my life when it barely feels like a few months have passed. Now I kind of wish that I’d written one of those ‘futureme.org‘ emails when I’d started TWC because I can’t really remember what July 2011 was like and I’d feel WAY too awkward going back and reading my posts. Plus I always love the idea of time capsules/surprises (I went through a phase of leaving £1 in all of my coin purses that I’d forget about, so that when I eventually decided to use it again I’d discover the money and be all ‘awww yeah let’s go buy some bubble gum’). Dunno if I’ve said this already but I told literally no-one, except my best friend, about the blog when I started it. I think it took about two or three weeks of me ‘sneaking’ around, taking photos of cakes with the crappiest camera ever before my mum eventually asked me what I was doing. I like to think that I was being subtle but evidently I really really wasn’t. It’s all right now, the fam is in the loop. Wouldn’t that be strange though if this whole time my family didn’t know I had a blog? Wow. They might just think that I enjoyed collecting single plates and planks of wood for fun (?) and was very particular about the amount of time that they had to wait before eating anything I’d made. Food blogging is kind of peculiar…and addictive and fun! I get to bake cake and pretend there’s more of a motive than me just really wanting some whipped cream. I made this cake for a roundup that Saveur asked me to contribute to for their 20th birthday! 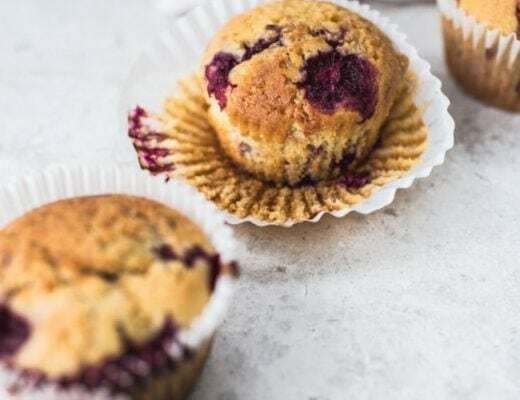 I figured that I might as well use it to celebrate my 3rd bloggaversary too as it’s suitably celebration-y and this way I can also give you the recipe! 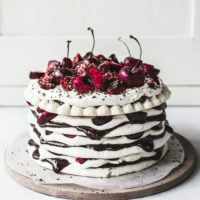 It’s not too difficult to make because it’s just meringue disks stacked up with ganache, whipped cream and cherries but you do have to have the oven on for over an hour (at a low temp) to dry out the disks sufficiently. 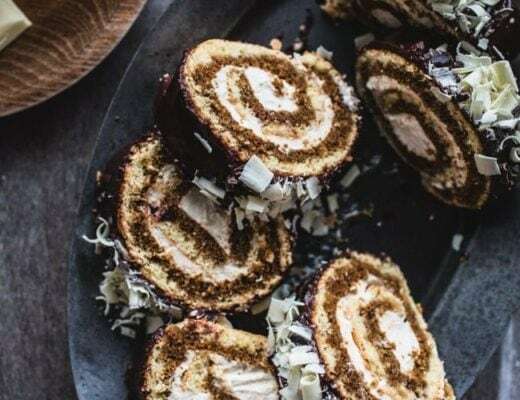 So if you’re boycotting the oven for the time being (thanks July heatwave 😐 ), you’ll probs want to avoid making this cake right now and just look at the pictures instead. To make the top meringue layer I filled a wide, plain tipped piping bag with the meringue mixture and piped little blobs in concentric circles. Whisk the egg whites in a stand mixer until you get soft peaks. Gradually add the sugar whilst you continue to beat the egg whites until the mixture is glossy and you get stiff peaks. If the mixture is rubbed between your fingers there should be no sugar crystals - if the mixture still feels gritty keep beating it until smooth, then finally beat in the vanilla extract. Spread the mixture out on two lined cookie sheets to form four, 6-inch diameter disks (see notes). Bake for one and a half hours in an oven preheated to 250 F (120 C) then switch the oven off and leave the meringue in the oven for a further hour. Melt the chocolate and stir in 1/4 cup of the cream. Whisk the rest of the cream until just thickened. To assemble: take one meringue disk and spread a quarter of the chocolate mixture over it. Spread a quarter of the cream over this and then scatter over the cherries. 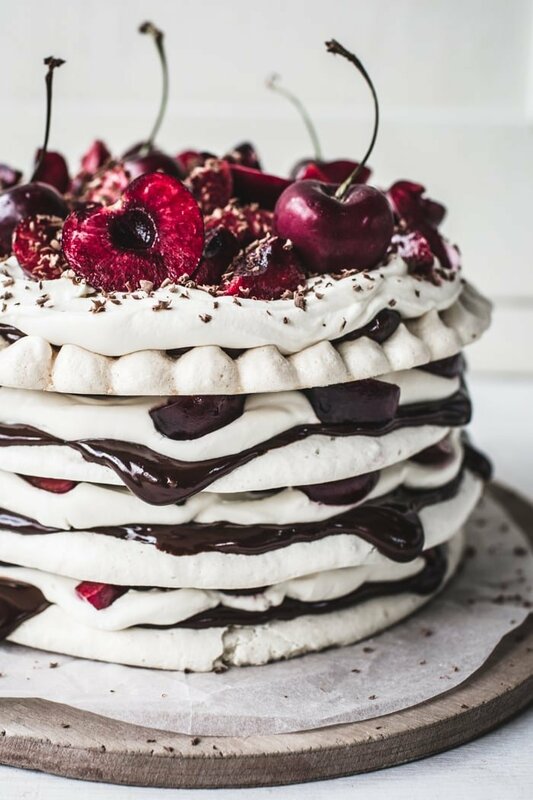 Top with the next meringue stack and repeat the chocolate, cream and cherry layering until you've stacked up all the meringues. Grate a little extra chocolate over the cake for a finishing touch. Serve immediately or freeze for an hour before slicing for a cleaner cut (see notes). I am a beginner in blogging, my blog is only 1 month old. But I hope one day to become as successful as you..! Happy Bloggaversary!!! And what a gorgeous cake! Happy birthday to your sweet blog Izy! Thanks for all the wonderful recipes and for all your hard work. This meringue cake looks amazing!! This cake is incredible Izy!!! I am so in love with this–the pictures are absolutely stunning. The chocolate ganache looks like it is JUST about to drip off the sides too! Wow. happy blog birthday izy!! i’ve been SO in love with this cake ever since i saw it on Saveur!! and now i can make it! yay!! happy birthday, top with cinnamon!!!!!!!! yayayayyy!!!! i love this cake so much, izy!!! Happy anniversary! I had to laugh when you said you waited a few weeks before telling any of your family about your blog. I actually have been blogging for over a year and just told my mom about it. I haven’t told any friends or coworkers yet. I’m just not ready to open my website up to scrutiny from people I know. But, the time is coming soon. I can feel it. And I’m scared! Congratulations!!! Cake looks amazingly good!!! Congrats Izy!!! Now I want to write an email to myself… That is a really cool idea!! You should do it and send it 3 years later! Love the cake!!! The cross section of the cake looks delightful! Yum yum yum… and congrats!! As always, your desserts are stunning. And of course delicious. I’m a big fan of meringue! I’m a new fan but since the first post which I’ve read, I’m constantly impressed. Especially with gifs! happy 3 years anniversary.. and what a cake to celebrate with. 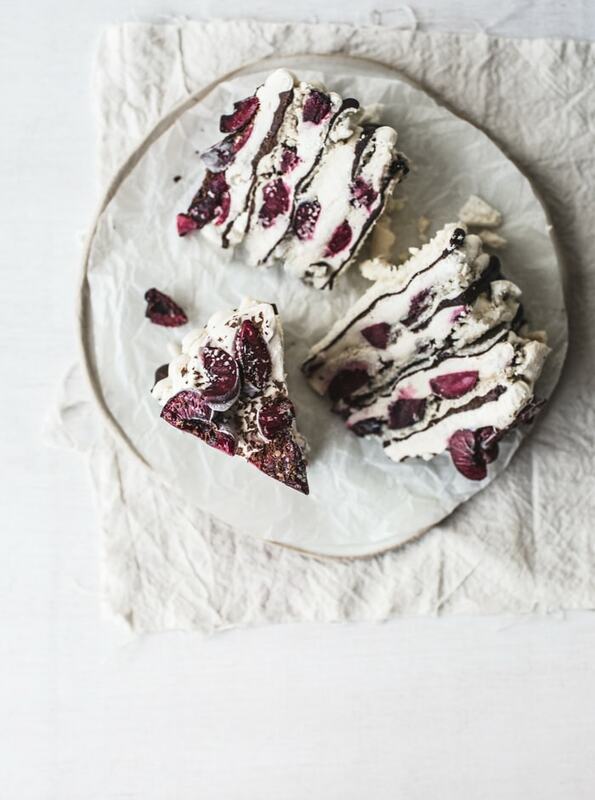 this has to be the BEST meringue cake i have ever seen, i am so craving a slice. love it! Happy Blogiversary, Top with Cinnamon! You’re writing and recipes are an inspiration to us other fellow food bloggers out there. Thank you for being awesome! And making that awesome cake. The most beautiful cake! I will have to try – love that its gluten free too. And cherries! You can never go wrong with cherries. Congrats on your anniversary! Holy balls that cake looks good girl!!! I love it!The photography is stellar and the cherries are lookin mighty fine! In fact….. there. I just went and got a mini bowl of bourbon soaked ones to munch on as I type this. Delish. PS. Congrats on 3 years!!!!! 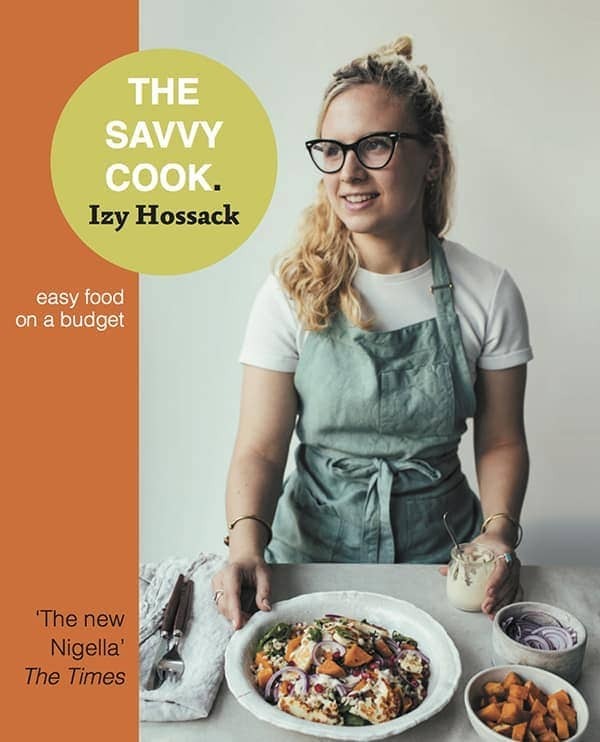 It’s a huge amount of work to maintain a food blog and you do it with style ! I know what you mean about starting out – I was so awkward to begin with! When I look back at my pictures and recipes from the first year, I shudder. I always wonder if I should remove them (4 years later) but I can never decide. Regardless, I’m stoked for you. Happy bloggy birthday! wooo happy bloggaversary!! congrats on an awesome 3 years of posting delicious recipes! keep up the amahhhhhzzzing work! So freaking happy for you! This cake looks like the perfect way to celebrate. Happy Birthday! Your blog is a toddler (the cutest stage, in my opinion!). This cake is stunning, and I love what you did with the top layer aesthetically. I can not wait to see what the future has installed for you and your food blog. Simply stunning and Happy B’day! Keep rocking it Izy! Happy 3-years!! You are killing it and this cake is crazy beautiful. Love the fresh cherries! Happy mofoing birthday, Top with Cinnamon! Here’s to a million more years of crushing it, Miss Izy. Hmm… Keeping blog secret? That would of been a good idea! My blog was slow to start off- my Mom was not to enthralled with the idea! Your cake looks so pretty. Happy birthday TWC!!! You just keep on doing what you’re doing, because we love it 🙂 Congrats Izy! HAPPY THIRD, YOU! I just posted my (2nd) blogiversary post a few days ago because I uh, might’ve missed mine on July 7th. Whoops. But I’m glad you remembered because this cake looks so fab 😀 I just need you to come over and we can stick our forks into it together. I can’t believe what a journey it’s been for you and am eternally glad we found each other. Wishing you many more awesome moments and times and years on the stellar blog to come, Izy! Congratulations! Your blog is so beautiful and you really deserved the Saveur food blog awards. I just wander what kind of recipe plug in you use..? Best cross section shot of meringue ever. Now I really want to try the freezing thing to get a neat slice. What a gorgeous cake and such a cool idea!! Happy anniversary!! I was really shy to start to tell people about having a blog – but then I was like, if my friends and family don’t read it, then who will? I have to start somewhere. .congrats!!! 3 years – what an achievement. congrats! Congrats on 3 years! What a beautiful dessert for celebrating!! Yep, the single plate, single napkin, single place mat — all signs of a food blogger! 🙂 Congrats on your blog anniversary and on the Saveur Editor’s Choice award. Well deserved!!! This cake is fantastic, I’ve been searching for something to make with my favorite seasonal fruit! Congrats on 3 years of successful blogging! The internet is truly a better place with TWC, Izy. Thank you for all that you do..you’re such a source of inspiration. Cheers from California!! congratulations on three years! this cake looks like the perfect delicious way to celebrate! Congrats Izy! I’ve felt honored to have followed your blogging journey almost from the beginning! I totally feel you on feeling awkward looking at old posts (I occasionally have the temptation to pop back there and clean them up…but never have the nerve to). #bloggerproblems The cake looks delicious! Congratulations on the 3 year mark Izy and I must say this Meringue Stack Cake looks amazing. Looking forward to your cookbook! Congratulations on 3 years Izy!!! I remember your 1 year anniversary like it as last month haha! Also, I laughed out loud at the collecting wood part ha! Congratulations, Izzy! Here’s to three (times tens) more! Congratulations! You’ve been doing a really good job for 3 years 🙂 And this meringue cake – gorgeous!!! Happy Blog Birthday Izy!!! Congratulations on achieving so much over the last three years. It’s an incredible achievement! 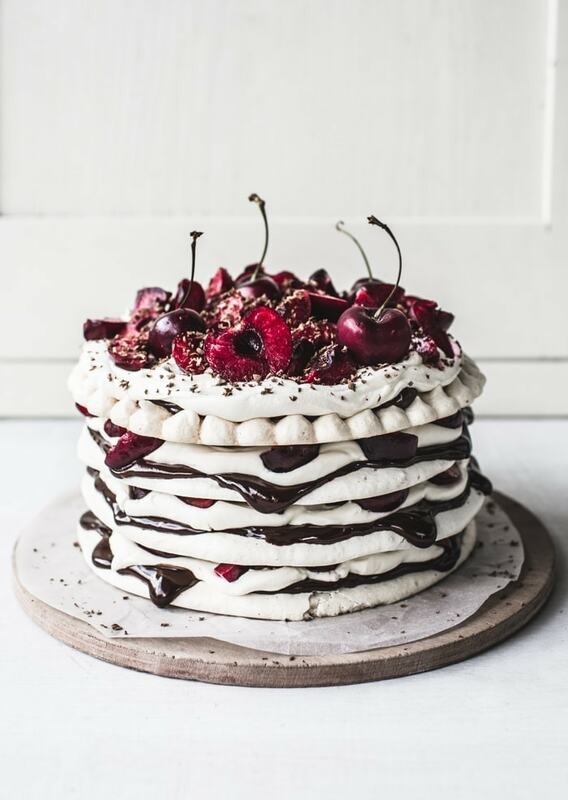 The meringue stack looks incred! Can you imagine the sugar-rush? Also, it would be pretty spectacular if you managed to keep this highly successful online space a secret from the family for so long! I am currently wheat free and in love with cherries! this is perfect! Congratulations on your blogoversary! This cake is stunning, truly stunning! Happy blogoversary! And yum–what an fantastic dessert! This is a very very pretty cake! its sooo beautifully created and looks soo fab! do you wear protection gloves when you prep your ingredients or you just do it with your bare hands? congrats on your blog! i am dying to make this cake for my best friends birthday but we live in the rockies and i was wondering if i should follow different directions for high altitude. Thanks!